Corrections are modest is the clue. The GBPUSD has trended lower today after the pair peaked against it's 200 hour MA a 1.27586. Since then the price has moved to the downside. The move has moved 255 pips from the high to the low. The corrections have been modest. That is what a trend move does. You can see that and measure an intraday trend move by looking at the 5-minute chart. Below is that 5-minute chart for the GBPUSD today. At the top of the chart, the pair was moving sideways, but when the price stalled at the 200 hour MA, it was the start of the first leg down (see red circle 1). That leg moved down to a new low of the day (from the 1st hourly bar), but stalled. The correction off that low corrected up to the 38.2% of that leg down (just above it). That is a modest correction and implies that sellers are in control. The price of the 1st leg higher then moved below the lows with momentum. Sellers were pushing and the buyers were scrambling. The next leg down (red circle 2) saw a bigger move lower. Like the 1st leg, the pair bottomed and started a correction. If you put a fibonacci of the trend leg lower, you can measure the "will of the buyers". If the buyers can't get above the 38.2-50% retracement area (I call it the correction zone), are they taking control? No! The seller remain in control. Seller can lean against the yellow area. If the price goes above, the waters for the trend are muddy. Stay below, however, and the seller remain in control. Start of trend leg 3 down. The third leg lower was a quicker and steeper trend move lower. The longs and dip buyers are really felling the pain. The price nearly runs to 1.2500, stalling just above that level at 1.2505 where another correction is started. The third correction has the same targets. The fibonacci of the leg lower has the 1.2560-78 as the "correction zone". Stall in that area and the trend is alive. Move above, and the trend waters are muddy. Putting it another way, the buyers and sellers are more balanced. In this case, the correction moved right up to the 50% retracement and stalled again. Are the buyers taking control? Not really. They did put up a bigger battle vs. the sellers but are they winning? No. Well, the sellers are still in control and the trend is still in play. What would muddy the water is a move above the 50%. It might not end the downside momentum forever, but it does muddy the water. The sellers feel some of the pressure of a bigger correction. Until then however, the trend potential continues. The sellers remain in control. If you can recognize a potential trend move early by noting the price action, measuring the corrections, seeing that trend legs stay below the "correction zones", you have a chance to ride that trend by understanding who really is in charge, and who is feeling the pain. 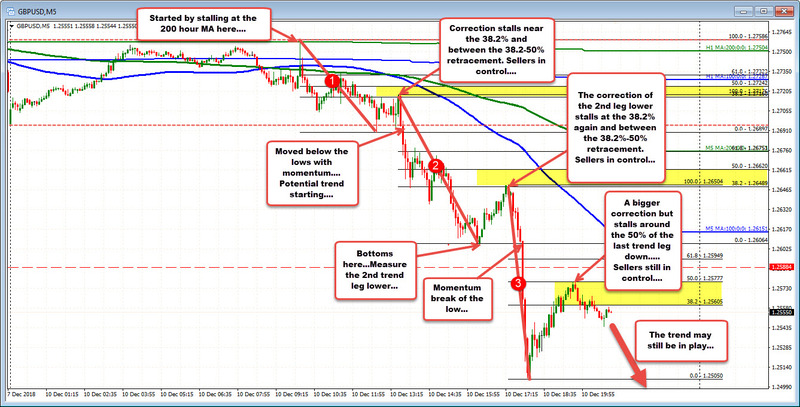 The run in the GBPUSD today clearly shows sellers in charge and hurting any buyers in the process. Until the waters get muddy, assume the pummeling has the potential to continue.